It starts with art. It doesn’t have to be pretty – we work from rough concepts on many projects. From a sketch or drawing, we redraw/scan/retouch/color separate to make it high quality and ready to print. Of course, if you have a print-ready logo file to upload, or use the design tool to build your own layout, you save time and money. Put it on film. The individual color parts for your art are printed onto specially coated clear film positives, using a waterproof, opaque black ink. For multi-color graphics, this step is critical to have all the parts of the design line up (or 'register') correctly. Make a screen. Fine screen mesh (it’s not silk these days, but polyester) is tightly stretched on a wood or aluminum frame. The mesh fabric is coated with a glue-like, light-sensitive emulsion, and once that dries, the clear film that we made in the previous step is placed between the screen and a halogen light source. The black art areas on the clear film block the light from the emulsion, and wash away to reveal open design areas in the screen mesh that will allow ink to come through. Go to press. Next, the screen is dried and clamped onto the press. When there are multiple colors in a design, the press operator lines the screens up to one another precisely, using a series of registration marks. This process has many other critical steps we won't go into in depth here, such as mixing custom ink colors to match Pantone formulas or other items. Print! Finally, once the screens are perfectly registered, inks mixed, and the pre-production proofs are OK’d, production can begin. The shirts are loaded onto flat platens on the rotating stations of the press. The screens are lowered to be parallel to the shirt surface, but not touching, and a squeegee is pulled across the screen using just the right amount of pressure. On multicolor designs, there's an additional step called spot curing, that entails a hovering flash heater curing the surface of the ink to the touch, so that a new layer can be applied without smudging prior layers. And the cure. The last but never least step is curing the ink on the printed shirts. This is critical — screen printing ink needs to reach proper cure temperature in a heated conveyor dryer in order to produce a lasting print. The correct amount of heat and time to cure varies widely between different fabric types and inks. 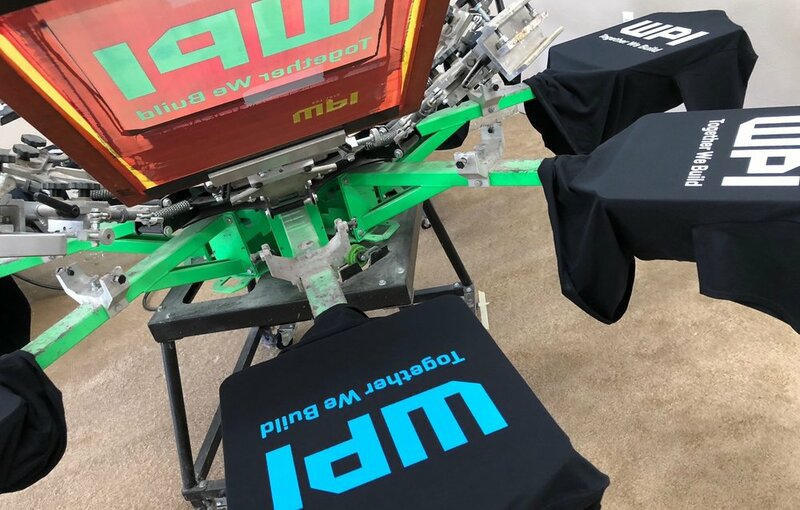 Our print artists are diligent about monitoring this last step to make sure your beautiful new shirt looks great for a long time, providing you excellent value.